If you feel in need of some love this cold, dark February, then our images of the week might be just what you need. 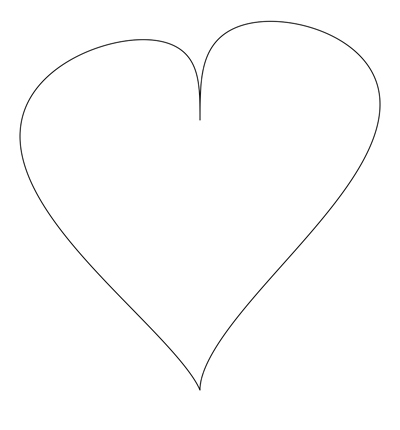 These hearts, created by Hamid Naderi Yeganeh, aren't drawn by hand, but defined by mathematical equations. Image by Hamid Naderi Yeganeh. You can see more of Hamid's images on this website, in The Guardian and on the American Mathematical Society website. The Cambridge Science Festival will kick off on March 9, and there is some great maths in the programme. Here are some maths-related events we are particularly excited about (in chronological order). Click on the links for price, booking and location information. For the full programme visit the festival website. And if you can't make it to Cambridge, then read the Plus articles by some of the speakers, linked to from the individual entries. Colour, new dimensions and the geometry of physics (March 10, 5pm - 6pm) — Nobel laureate Frank Wilczek talks about his work on finding a theory that explains all the fundamental forces and particles we see, and his popular book The lightness of being. To find out more about Wilczek's fascinating research, read the Plus article Strong but free. Order out of chaos (March 11, 6pm - 7pm) — Imre Leader explores how order can be found in chaos, as long as there is enough of it. Leader is a great speaker and the topic's very accessible. Find out more in this video or this Plus article. Let Newton be! (March 11, 7:30pm - 9:30pm public performance, 2:30pm - 4:30pm schools performance) — This play brings the complex and controversial character of Sir Isaac Newton to life: a devout, difficult, obsessive man who sought and found god in universal laws of light and motion. Theatrical, entertaining and informative, the play explores the life and thought of a genius whose scientific theories still provide the foundations for our understanding of the Universe today. Some essential links between maths and the arts (March 12, 5:30pm - 6:30pm) — John D. Barrow explores a range of links between mathematics and some of the arts; including Dali's use of 4D geometry, how fractals are used to distinguish abstract art works, the plan of the subterranean Tunnel of Eupalinos in 520BC, and how smooth curves inform Henry Moore's stringed sculptures. For a taster, read Barrow's Plus article Where to stand to look at sculptures. Enigma and the secret world of code breaking (March 14, 10:30am - 11:30am) — James Grime looks at the fascinating history and mathematics of codes and code breaking - from ancient Greece to the present day - including a demonstration of an original WWII Enigma Machine! For a brief introduction, see the Plus article Exploring the Enigma. Illuminating statistics (March 14, 10am - 4pm) — The modern world is full of numbers. It is more important than ever that we know how to ask, answer and understand questions about public health in this sea of numbers and data. Come join the MRC Biostatistics Unit and take part in activities that will show how and what we can learn from numbers. For a brief intro, listen to our interview with Sheila Bird from the Biostatistics unit. Seeing further than others: Isaac Newton's world of light and colour (March 14, 11am - 12:30pm) — Rob Iliffe, Director of the Isaac Newton Papers Project in the University of Sussex, talks about Newton's work on light and his great publication Opticks. The talk will be accompanied by a display of Newton's manuscripts from the University Library's treasured collections. Stamping through mathematics (March 16, 6pm - 7pm) — Robin Wilson explores the entire history of mathematics in one hour, as illustrated by around 300 postage stamps featuring mathematics and mathematicians from across the world. From Euclid to Euler, from Pythagoras to Poincaré, and from Fibonacci to the Fields Medals, all are featured in attractive, charming and sometimes bizarre stamps. No particular knowledge of mathematics or philately required. CSAR new book evening: meet the authors (March 16, 7:30pm - 9pm) — This evening is organised by the Cambridge Society for the Application of Research and showcases new books and publications. Speakers will give a short talk on their latest title, followed by questions and a reception with the authors. Among four amazing authors is one of our favourites, John D. Barrow, who is also the director of the Millennium Mathematics Project of which Plus is a part. He will talk on his most recent book 100 Essential Things You Didn't Know You Didn't Know About Maths and the Arts. Don't miss it! El Niño: what on earth will happen next? (March 19, 5:50pm - 6:30pm) — El Niño events are the largest causes of year-to-year climate variability on a global scale, bringing floods to some regions and droughts to others. Join Michael Davey as he explains the phenomenon, explores the impacts, and describes how maths helps us understand how they occur and evolve. Maths public open day (March 21, 12noon - 4pm) — Come and visit the home of Plus! From Isaac Newton onwards, Cambridge has been associated with some of the most famous mathematicians in history. Modern mathematicians and theoretical physicists work on everything from the Big Bang to prime numbers, fluid dynamics or investigating the spread of disease. Join the Plus editors, as well as students and staff from the Faculty of Mathematics, to explore the excitement of mathematics and theoretical physics through hands on activities, demonstrations and displays. 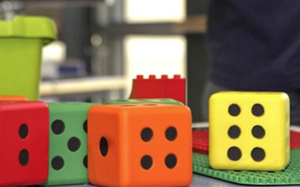 Thinking mathematically (March 21, 12:15pm - 1:15pm) — Join Charlie Gilderdale to work on some of his favourite mathematical problems from our sister site NRICH, and discover that everyone can think mathematically. Come prepared to explore, discuss, conjecture, question, explain and generalise! The Large Hadron Collider and the dark matter mystery (March 21, 2pm - 3pm) — The Large Hadron Collider will start operation again at a higher energy at the beginning of 2015. Join Ben Allanach for an introduction to the machine, particle physics, the discovery of the Higgs boson, and what its observations tell us about the mysterious dark matter. For a brief intro, read Ben Allanach's Plus article Particle hunting at the LHC. Why are stringed instruments so hard to play? (March 21, 6:30pm - 9:45pm) — The motion of a bowed violin string has been studied since the 19th century, and shows some quite unexpected behaviour. This talk by Jim Woodhouse, University of Cambridge Department of Engineering, will show some examples of how computer modelling combined with acoustic measurements can shed light on playability of bowed-string instruments. This talk is followed by a concert of works by Mussorgsky, Elgar and Tchaikovsky including the cello concerto by Elgar with soloist Olivia da Costa. To prepare, read Jim Woodhouse's Plus article Why is the violin so hard to play?. This short video features one of our favourite mathematicians, Corinna Ulcigrai from the University of Bristol, talking about mathematical billiards, its connection to chaos theory, and why mathematicians study it. You can also read our article Chaos on the billiard table, based on an interview with Ulcigrai. This video was originally produced for the Cambridge Mathematics Education Project. Maths ... it gives you wings! 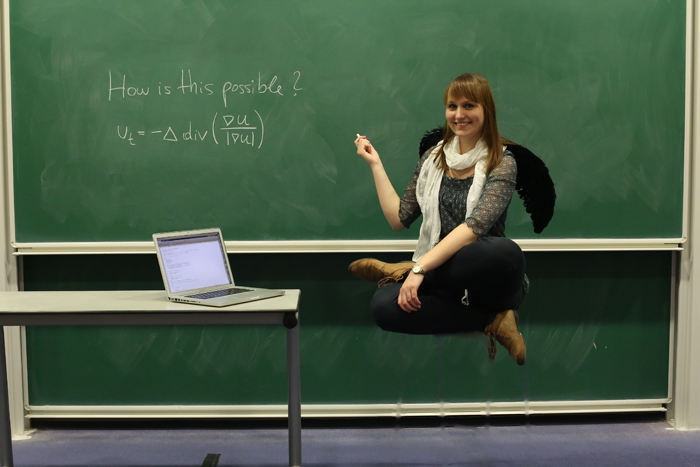 Our image of the week shows Joana Grah, the levitating PhD student. Image by Carola-Bibiane Schönlieb, Joana Grah and Kostas Papafitsoros. It's not supernatural powers that help Joana fly, but the equation on the blackboard. 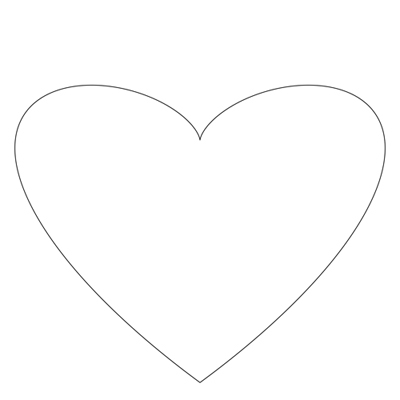 This partial differential equation can be used to fill in specific parts of an image based on what's around it. The process is called inpainting. For this image the equation was solved numerically to remove the stool Joana was sitting on. Image inpainting has wide ranging practical applications: from the restoration of satellite images, enhancement of medical images, the renovation of digital photographs and artwork, to special effects in images and videos. This image was created by Carola-Bibiane Schönlieb, head of the Cambridge Image Analysis group at the Department of Applied Mathematics and Theoretical Physics, University of Cambridge, Joana Grah and Kostas Papafitsoros. It won the EPSRC science photo competition in 2013. You can read more about Schönlieb's work on inpainting in this Plus article. See here to see previous images of the week. The image was created by Hamid Naderi Yeganeh. You can see more of Hamid's images on this website and on the American Mathematical Society website. See here to find out more about the complex plane and here to see previous images of the week. Charlie Stripp, Chief Executive of Mathematics in Education and Industry (MEI), has been awarded an MBE in the 2015 Queen's New Year Honours List in recognition of his services to education. Charlie Stripp. Image from the NCETM website. Charlie taught mathematics for ten years in the state sector before joining MEI in 2000 to set up the pilot project that eventually became the Further Mathematics Support Programme. He became MEI's Chief Executive in 2010. Charlie is also Director of the National Centre for Excellence in the Teaching of Mathematics (NCETM), seconded from MEI on a half-time basis, and is regularly consulted by the government on mathematics education issues. "I am delighted for my work to have been recognised with this very special honour," says Charlie. "In recent years there have been unprecedented changes in mathematics education, particularly in curriculum development and the professional development of teachers, and it has been a privilege to have been in a position to influence them." MEI's Chairman Gerald Goodall says: "MEI plays a leading role in expanding opportunities for access to high quality mathematics education and we are very fortunate to benefit from Charlie’s leadership. MEI's trustees and staff are delighted to see Charlie's hard work and dedication recognised in this way."